I AM FINALLY USING IT! In any case I did take it out of the box, look at it, read the manual and recipes and then put the box on the top shelf and the grill on the opposite middle shop where is stayed for 15 or less years--well not really as I moved into this apartment in 2004 so I could have done that any time between 2004 and yesterday. On Thursday I had bought and shared 8 Angus beef burgers with Allen. After I micro waved the first for 4 minutes and wound up with a charred piece of coal. 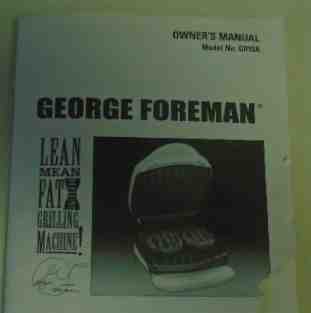 I was thinking of trying the crockpot but that was too big s-o-o-o-o-o-o-o I looked and there was the George Foreman Grill that Chuck (and /or Chuck & Terry) gave me. Surprisingly it made a good burger but had to put the cheese on separately. Also it was a bit of a clean up job. Next week I’ll try some chicken as it cooks pretty fast, doesn’t dry out the food and does drain off the fat/grease. Hey Chuck, before you get old, when did you give me the grill? And were you and Terry together then? Sorry Terry someday you will be old too--it starts at 71!